Justice Christa Brothers and the Federal Crown prosecutor both expressed concerns over the lawyer’s request to withdraw, citing Jordan deadlines. R. v. Jordan was a landmark Supreme Court of Canada case decided in 2016, setting harsh deadlines in which criminal cases must be completed, from the initial charge to the disposition. As the accused was charged in July 2016, and the deadline is 30 months from the time the charges were laid for this respective case, the “Jordan clock” is ticking fast. Justice Brothers and the Federal Crown were right to express concerns about the lawyer’s request to terminate her solicitor-client relationship with the accused, which would effectively leave him defenseless and without counsel at his upcoming trial. Although clients have the right to terminate the solicitor-client relationship at will, for any reason, lawyers do not exercise this same right. Lawyers are generally required to “complete their retainers” unless there is a justifiable cause for terminating the retainer. Reasonable notice should be provided to the client about the lawyer’s intentions to dissolve the solicitor-client relationship. The Rules of Professional Conduct are governed by the guiding principle that lawyers are to protect their client’s interests. This means that action (or inaction) of a lawyer should not prejudice or disadvantage a client at a critical stage. The lawyer’s request to terminate the accused’s retainer five months shy of a trial for which serious criminal charges are being tried can be argued to be deserting the client at a critical stage that would potentially put him in peril. Generally, clients should be provided with sufficient time to retain and instruct new counsel. The Rules of Professional Conduct guide lawyers to ensure that “withdrawal occurs at an appropriate time in the proceedings in keeping with the lawyer’s obligations.” What constitutes an “appropriate time” will always be dependent and relative to the matter for which the lawyer is retained. Generally speaking, when a lawyer is retained for a criminal matter, the lawyer will face more hurdles and difficulties in terminating the solicitor-client relationship. This is because of the significant disadvantage and prejudice that is intimately inherent of clients facing criminal proceedings. Sanctions can carry custodial sentences and many other restrictions on liberty (such as undertakings), which inarguably would prejudice a client should his or her counsel elect to terminate the relationship at an inappropriate time. Lawyers are generally only permitted to withdraw from criminal proceedings if the interval between the trial of the case is sufficient to enable the client to retain and instruct another lawyer. This interval between the trial of the case and the withdrawal must also allow for the “successor lawyer” to adequately prepare for the case at bar. The most common reasons for the lawyer’s termination of the relationship are either the breakdown of the solicitor-client relationship, or the the client’s inability to pay the agreed upon fee. The Rules of Professional Conduct outline that lawyers may be permitted to withdraw from criminal proceedings provided that they notify the client in writing that they are withdrawing from representation because of the client’s inability to pay the agreed upon fee. The lawyer must also account to the client for any fees and disbursements and notify the Crown counsel in writing that the lawyer is no longer retained. The records of the court must also be updated in writing, making certain that the lawyer is no longer acting, and counsel of record. The caveat to this is that even when a lawyer does do everything right by providing proper notice because fees are not being paid, the lawyer might still not be permitted to withdraw because of non-payment of fees. This will occur if the lawyer is seeking withdrawal from a criminal proceeding and the interval of time between the trial of the case is insufficient to enable the client to retain and instruct new counsel, even if the client is not paying the agreed upon fees. The reasoning behind this is that the client’s legal interests will be adversely affected, or prejudiced, and this is not acceptable. 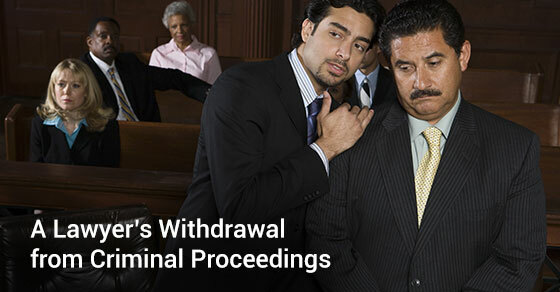 Lawyers seeking withdrawal from criminal proceedings always require permission of the court. Justice Brothers ordered the accused’s matter to return to court in one month’s time to update the court. The lawyer was directed to further her attempts to secure the agreed upon fee, and/ or to facilitate the finding of a new lawyer for the defendants.